Metallurgical engineer Paul Cantonwine shares insights into the life and career of Admiral H. G. Rickover in this biographical episode of The Engineering Commons podcast. As an undergraduate student, Paul figured that since everything was made of materials, he could ensure job security by choosing Materials Engineering as his field of study. Our guest began his engineering career at the Bettis Atomic Power Labratory, working with zirconium alloys. Neutron cross section refers to the likelihood that, within a given target material, an incident neutron and a target nucleus interact with one another. Brian notes that the U.S. Navy’s Virginia-class submarines, and soon-to-be-introduced Ford-class aircraft carriers, are nuclear-powered. Our guest finds that keeping the customer in mind helps when making difficult technical decisions. Admiral Rickover was featured on the cover of Time Magazine in January 1954. Spending 63 years in the U.S. Navy, the first half of Admiral Rickover’s career was fairly ordinary, notes our guest. Although Rickover was an electrical engineer by training, there seems no particular reason he was chosen to attend a nuclear power training course being held at the Oak Ridge National Laboratory in Eastern Tennessee. Rickover foresaw the benefits of a nuclear-powered submarine, even when others doubted its technical feasibility. Although not a stellar student, Rickover was driven by ambition, an incredible work ethic, and a lifelong love of learning. Every ensign charged with running a nuclear power plant had to interview with Admiral Rickover; none forgot the experience. Brian compares Rickover’s interviewing techniques to the job interview scene in the 1997 movie Men in Black. One reason for Rickover’s obsession with personnel selection was concern for possible nuclear accidents, a fate which befell the U.S. Army’s Stationary Low-Power Reactor Number One in 1961. To test components for shock resistance, Admiral Rickover would throw equipment against a radiator in his office. 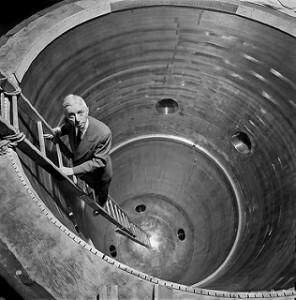 There was no readily available source for pure zirconium when Rickover started developing nuclear components, so he had to develop his own refining plant. Admiral Rickover was a man of action, and Paul suggests that today’s engineers can likewise have a significant impact on society if they strive to develop beneficial technologies. Thanks to the Nuclear Regulatory Commission for use of the photo titled “Admiral Hyman Rickover.” Opening music by John Trimble, and concluding theme by Paul Stevenson. I happen to think that solar roadways could be a good idea but I don’t think that “solar FREAKIN’ roadways” is practical. I’m not in favor of driving on photovoltaic cells. The most ideal solar collector that I can think of is a black body at absolute zero. Although an asphalt road would not be very practical at at 0K it will still absorb a remarkable amount of heat as it is. The problem is you don’t want to get the pavement up to temperatures that would be good to run a conventional heat engine on. The greater the temperature difference between the hot side and cold side of an engine the more efficient it can be. An engine will always reject some heat. It simple can’t be 100% efficient. For the heat to be rejected by the engine it must flow to a sink of lower temperature. That would seem to indicate that the rejected heat coming out of the engine must always be greater than ambient temperature. But must that always be the case? Is there a way to bring the temperature of an object below ambient? Is it economical to lower the temperature of a heat sink for an engine to reject its heat into? A conventional heat pump is 300% to 400% efficient. Combining it with an engine of 33% to 25% efficiency would make it to the break even point. If the rejected heat is compressed to raise its temperature then fed back into the input of the engine how much heat could be converted to mechanical energy? If the initial heat source is a nuclear reactor in a submarine, how much of a heat signature would there be? How much of a heat signature do modern submarines have? Even in deep water, if hundreds of kilowatts are rejected by the turbine engines and dumped into the ocean would long wave infrared be emitted into space to be detected by satellites? How much of a problem is it for the navy to have their submarines sitting on the bottom of an ocean with an idling reactor feeding a turbine with efficiencies of, presumably, upwards of 60%. Just idling I would guess they are still using tens of kilowatts just to run the air generators and circulators. Wouldn’t that warm the surrounding water which would rise to the surface and give away their position? Perhaps we may never know all the secrets of nuclear energy.